A quilt made by Elizabeth Keckley, a woman born into slavery who became a distinguished writer and seamstress. 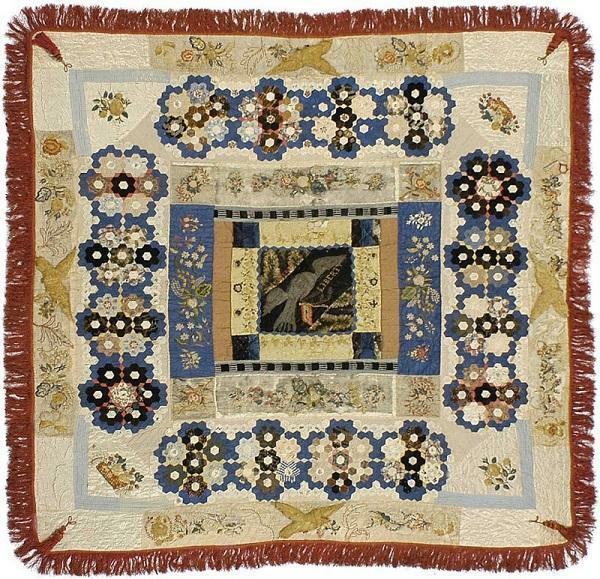 This quilt is said to be made from scraps of Mary Todd Lincoln's dresses. A historic marker outside the Burwell House in Hillsborough marks the life of Elizabeth Keckley. A portrait of dressmaker and writer Elizabeth Keckley circla 1861. Keckley was born into slavery in Virginia, and later became the first paid African-American employee to work in the White House. Host Frank Stasio talks with professor Sheila Smith McKoy about the life and legacy of Elizabeth Keckley. Keckley was born into slavery in Virginia in 1818. She spent about six years enslaved in Hillsborough, North Carolina, and eventually traveled to St. Louis, where she purchased her own freedom. Keckley later moved to the District of Columbia where she rose to prominence in her career as a seamstress. 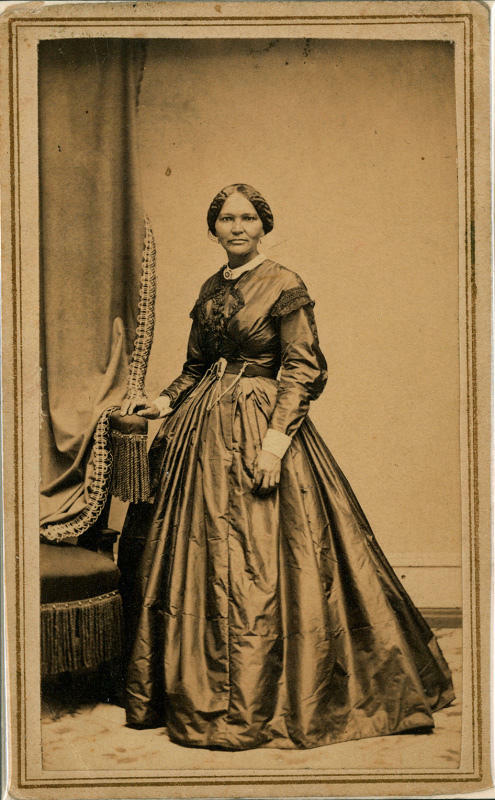 She sewed for the wives of senators and eventually became the personal dress maker and confidante of Mary Todd Lincoln, making her the first paid African-American employee in the White House. The new collection of scholarship “The Elizabeth Keckley Reader, Volume One: Writing Self, Writing Nation” (Eno Publishers/2016) illuminates Keckley’s life and writings. Host Frank Stasio discusses the collection with Sheila Smith McKoy, professor and chair of the department of English at Kennesaw State University. She stood her ground. Many of the slave narratives that we have from women indicate women who, though abused, did not fight back [...] But Keckley did and demanded to know why she had been beaten [...] It was Keckley’s fierce courage, I think, that brought people literally to their knees even when they were doing wrong things to her. Most [slaves] did not purchase their own freedom. If we think about Frederick Douglass’ freedom it was purchased by his abolitionist friends [...] In Keckley’s case, at the time, she was supporting the entire family of 17 [...] Garland set a price of $1200 which Keckley set about to try to raise. One of the benefits of her talent with the needle was she befriended many wealthy women in St. Louis who were her clients. They gathered that money together for her, and she sewed for 5 years until she paid it back. She was sewing for both sides, if you will, of the North-South divide. She was sewing for Jefferson and Varina Davis [...] and then she later sewed for Lincoln, and she was sewing for the wives of several senators [...] when Jefferson Davis was taken into captivity it is said he was wearing a chintz gown that she sewed for his wife. In the fiber culture of that era you had a very intimate relationship with your seamstress. Keckley did not bill herself, however, as a seamstress. She billed herself as a modeste--a designer and a creator of fashion. One also has to remember [...] Mrs. Lincoln was, by all accounts, the first first lady to set fashion trends. In fact she spent an awful lot of money in the White House on her clothing, most of which Keckley sewed with her own hand. They also bonded quite quickly after Keckley came to the White House during the time when Mary Todd Lincoln’s son Willie lay dying [...] And she was very dependent on Keckley during that time. And we see this unfolding with the death of President Lincoln, Keckley again was called to her side [...] eventually Keckley was even given some of the articles that Lincoln wore when he was assassinated. At that time in the United States there was a lot of outpouring about the life of enslaved people. Keckley’s narrative is a bit different [...] We were accustomed in our readership during this era of having abolitionists, white people, write on behalf of black people who have been enslaved. Keckley’s narrative does just the opposite. You have a freed-woman who purchased her own freedom who is financially in great shape.